Video (00:50) : Sarah McLellan recaps the 6-2 win over the Canucks in her Wild wrap-up. Moving past a letdown like the one the Wild suffered Tuesday to the reigning Stanley Cup champion Capitals isn’t always easy, especially when a team is missing a key forward. But the Wild did it with ease Thursday, dispatching the Canucks 6-2 at Xcel Energy Center, and that’s a hallmark of the best teams in the league – a descriptor that continues to stick to the Wild after its latest triumph boosted it to the second-most points in the NHL (26). The Wild was without winger Zach Parise, as he remained at home with illness. But the team didn’t skate like it was shorthanded. Instead, a two-goal first period was the kind of authoritative start expected of a team eager to rebound from a deflating 5-2 loss Tuesday to Washington. From there, the Wild only improved – pulling away from Vancouver amid three more goals in the second. It was the type of statement that reinforces why the Wild is one point behind the league-leading Predators and Lightning. The team has yet to suffer two straight regulation losses this season, and only twice has it dropped two games in a row. “It’s very important to get that confidence back in our home building and make sure we’re going to build on it,” Koivu said. The Wild should have more clarity on Parise’s status Friday. Coach Bruce Boudreau hopes Parise rejoins the group at practice but if he can’t, his availability for Saturday’s game against the Sabres may be in question. 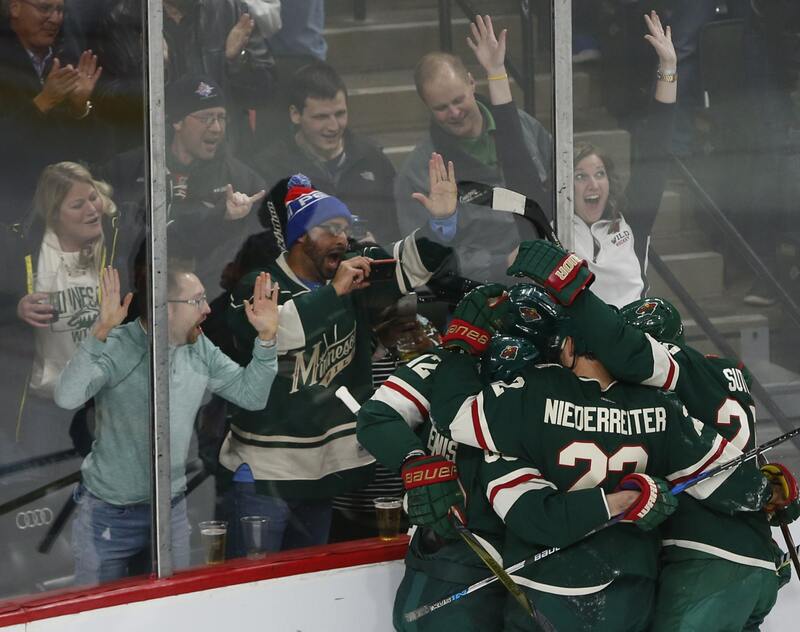 Without Parise, the revamped Koivu line featuring wingers Nino Niederreiter and Charlie Coyle shined – racking up five total points and scoring the game’s first three goals. Two of those came on the power play. Coyle had a game-high six shots, while Koivu had three and Niederreiter two. “We want to be able to play in their end,” Coyle said. “To do that, you have to simplify to get down there. We should be able to hang onto the puck, like we did for the most part. Things open up when you hang onto it and you don't force things. We generated a lot of shots and some chances from it. It paid off for us." The defense also contributed its 17th goal of the season, which is tied with the Senators for the most in the NHL. For the second straight game, defenseman Matt Dumba recorded a tally – this one a seeing-eye point shot.